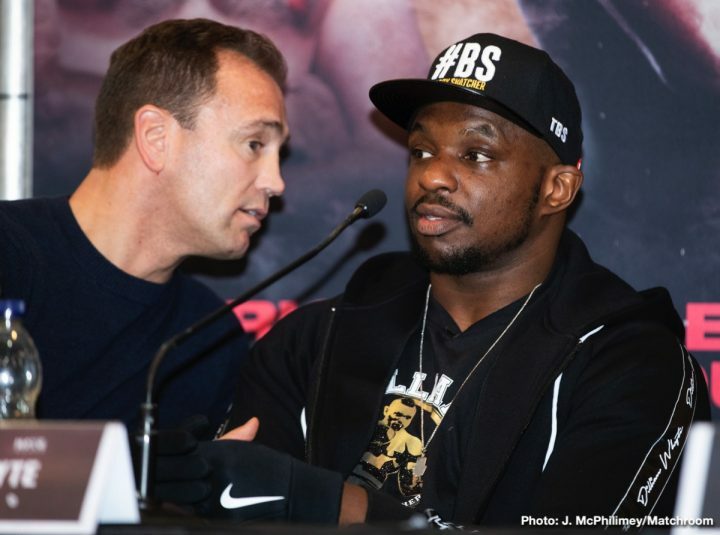 By Tim Royner: The WBC will be making a decision on the heavyweight Dillian Whyte’s status within the next 2 week, according to Matchroom Boxing promoter Eddie Hearn. Matchroom is looking to have the WBC order the winner of the May 18 fight between WBC heavyweight champion Deontay Wilder and Dominic Breazeale to immediately face Whyte (25-1, 18 KOs). Hearn wants the World Boxing Council to install Whyte, 30, as the next mandatory to fight the Wilder vs. Breazeale winner. Hearn has already met with WBC president Mauricio Suliaman on the subject. Sulaiman will be going back to his WBC board of governors for them to make the decision. #1 WBC Whyte is unhappy that Breazeale (20-1, 18 KOs) has been given a mandatory title shot over him against Wilder (40-0-1, 39 KOs). Whyte is ranked higher than #3 WBC Breazeale in the World Boxing Council’s rankings, and he’s been facing better opposition in the last three years. Additionally, Whyte holds the WBC Silver heavyweight title. “We had a meeting on the mediation of the situation. The WBC will go through the procedure and go back to their board of governors. They’ll review our proposals,” Hearn said to IFL TV. “It’s pretty clear what we want, to get the mandatory position for Dillian Whyte. They’ll review it, and we’ll hear back from them in two weeks,” Hearn said. What Hearn and Whyte might not understand is the main issue was caused by the WBC failing to order the mandatory in 2018. The World Boxing Council let Breazeale sit for close to two years as the WBC mandatory without ordering Wilder to defend against him. Breazeale has been the WBC mandatory since beating Eric Molina in 2017 in an official WBC eliminator. At some point, the WBC should have ordered Wilder to defend against Breazeale. Instead, Wilder was permitted to defend his WBC belt against Luis Ortiz and Tyson Fury in 2018 while Breazeale at and waited for the sanctioning body to finally order Wilder to defend against him. In the meantime, the WBC did an odd thing in ranking Whyte ahead of Breazeale in their top 15 rankings despite the American having already earned the mandatory spot. The next thing the WBC did was order Breazeale to fight Whyte for their interim WBC heavyweight title. In essence, Breazeale would have had to fight in another eliminator just to get the title shot against Wilder that he’d already earned with his victory over Molina in 2017. The reason the WBC ordered Breazeale and Whyte to fight for the WBC interim title is because Wilder and Fury were going to fight each other in a WBC ordered rematch on May 18. Fury decided to jump ship and sign with Top Rank Boxing, who wanted no part of letting Fury fight Wilder in an immediate rematch, so they pulled him out of negotiations and scheduled him instead to fight little known German fighter Tom Schwarz in a showcase fight on June 15. Once Fury was no longer going to fight Wilder on May 18, then WBC went ahead with giving Breazeale his mandatory shot against Wilder that he earned back in 2017 with his win over Molina. Hearn and Whyte perhaps weren’t aware of Breazeale having ALREADY earned the WBC mandatory shot 2 years ago, so they’re trying to get the WBC to order the Wilder-Breazeale winner to face Whyte. If WBC gives Hearn and Whyte their way, Wilder would need to fight consecutive mandatory challengers. That’s a bad deal for Wilder, because he would be dealing with cleaning up the mess the WBC made by not ordering him to defend against Breazeale last year. That’s when the WBC should have ordered the Wilder-Breazeale fight, not in 2019. Wilder probably won’t mind defending against Whyte. It’s not as if Fury is going to face him in 2019, and it’s also unlikely that a unification match with Anthony Joshua can be made. If Hearn wants to match Whyte against Wilder in 2019, then that fight shouldn’t be an issue for Wilder. However, it’s a bad idea for Whyte to take the fight against the dangerous Wilder rather than waiting for his title shot against Joshua. I mean, Whyte can make a heck of a lot more money fighting Joshua than he can fighting Wilder. Why risk losing out on the bigger money fight against Joshua by facing a knockout artist like Wilder? If this turns out badly for Whyte with him getting knocked cold by Wilder, he’ll be crying crocodile tears later, wishing he’d waited for the Joshua fight instead of facing Wilder. As bad as Whyte looked in his recent fight against journeyman Dereck Chisora last December, the last thing he should be doing is trying to fight Wilder. If Wilder destroys Whyte, it’s going to be a major setback for his career. Obviously, Whyte will still get a title shot against Joshua at some point in the future, given that he’s promoted by the same promotional company as AJ in Matchroom Sport, but you can imagine Whyte’s purse will be smaller if he loses to Wilder. If the WBC chooses to give Whyte a crack at the winner of the Wilder vs. Breazeale fight, then they’ll be giving Dillian and Hearn what they both want. Wilder doesn’t have to take that fight next though if he faces Joshua in a unification fight. However, putting a fight together against Joshua could prove difficult due to AJ wanting the bigger purse. As such, Wilder might get stuck fighting Whyte next. Again, it’s not a big deal. Wilder has to fight somebody anyway, and Whyte is a decent option. It’s too bad Whyte didn’t fight Luis ‘King Kong’ Ortiz when the WBC wanted Dillian to take that fight for their secondary title eliminator. Hearn hasn’t shown interest in putting Whyte in with the southpaw Ortiz. Instead, he’s been matching Whyte against beatable guys like Lucas Browne, Robert Helenius, Chisora, Malcolm Tann, Joseph Parker, Dave Allen and Ivica Bacurin. Whyte could have made things easy for himself if he’d taken the fight with Ortiz last year to earn the secondary WBC mandatory spot.